It was like déjá vu, and in more ways than one. 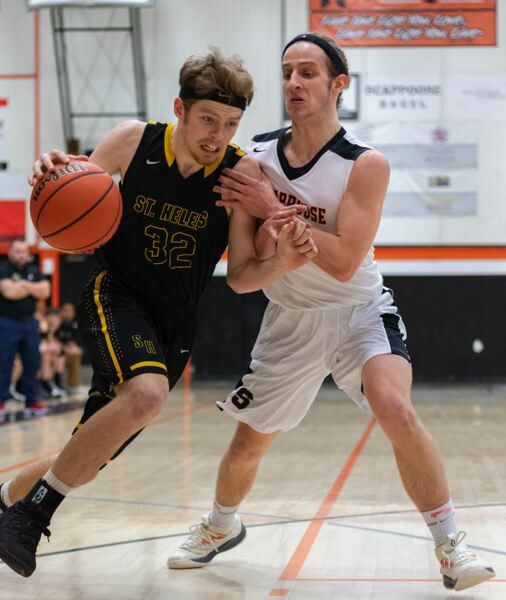 The St. Helens and Scappoose boys basketball teams went at it ferociously on Tuesday at Scappoose, just as the two teams had done 25 days earlier in the St. Helens gym. The Lions led nearly all the way, as they did on Jan. 11. The Indians kept fighting back, as in the first meeting. In the final seconds, Scappoose had the ball with a chance to win or at least tie. But, as was the case in January, the Indians couldn't covert, which left the Lions with the victory. Again. No one expected any less than such competitiveness and drama in this latest version of the "Seven-Mile War." "Rivalry games are like that," St. Helens junior guard Canon Beisley said moments after his team pulled out the 52-50 win at Scappoose. "You've got to go extra hard." On Jan. 11, the Lions nipped the Indians 39-38. St. Helens got the winning score that night on senior forward Ryan Hastings' floating put-back with 4.1 seconds to go. Both teams had reasons to look forward to Tuesday's rematch. "They've been saying we got them on a lucky one," St. Helens senior forward Chris Beatty said. "Everybody was fired up on both sides." It also was Senior Night for Scappoose. And Beatty said the Lions noticed how they were picked to be the visiting team for that special occasion. "They thought they were going to get us," he said. Scappoose hasn't won a league game since moving up this season from the Class 4A Cowapa League to the 5A Northwest Oregon Conference. That also served as motivation — for the Lions. "We didn't want to be their only win," Beatty said. Lions-Indians II could have gone either way. The intensity only increased with each quarter and reached its peak down the stretch. Scappoose pulled even at 48-48 on a 3-pointer by junior guard Jake Boyle with 3:15 remaining. St. Helens regained the advantage on back-to-back drives by Beisley and Beatty. Boyle then hit from 17 feet to pull the Indians to within 52-50 with 1:55 left. Neither team scored the rest of the way in a wild finish that included three St. Helens turnovers and four Scappoose possessions without a point. In the Jan. 11 game, Indians guard Connor McNabb missed a running shot for the win at the buzzer after dashing the length of the court. On Tuesday, McNabb got two chances at the end. First, he couldn't get a hard-driving 10-footer to fall inside the 10-second mark. Then, after a missed one-and-one by Beatty with 5.1 seconds left, McNabb flew full-court again only to get swallowed up under the basket as time ran out. For the Indians, it was a tough loss to swallow. "The kids are frustrated, because it's our rival, right down the street," Scappoose coach Matt Humphreys said. "But I was really proud of them. We've improved a lot this season. We made some shots off the dribble tonight (and hit 10 of 19 3-point attempts)." From the field, St. Helens connected on 17 of 42 shots (5 of 14 on 3's, 12 of 28 on 2's), while Scappoose was 16 of 38 (6 of 19 on 2's). At the foul line, the Lions were 13 of 25 to the Indians' 8 of 16. The Lions led 13-7 after one quarter, 31-28 at the half and 41-40 going into the fourth quarter. But St. Helens' largest lead was only 37-29, and it came early in the third quarter. "It was fun to be in a competitive game so back and forth," first-year Indians coach Humphreys said. "They had the lead most of the time, but I felt like we were right there most of the time. "I'm sure it was fun to watch, and our fans were awesome." While Scappoose fell to 2-16 overall and 0-9 in the NWOC, St. Helens improved to 4-13, 2-6, and snapped a four-game skid. The Lions' first-year coach, Zach Waldher, called it a "huge win for the culture and accountability and everything we're trying to do here going forward. Just gigantic." St. Helens had the game's leading scorer in sharpshooting junior forward Gavin Knoke. He hit four of his first five tries from 3-point range and finished with 18 points. But the Lions got big contributions up and down their lineup, notably from Beatty (13 points), Beisley (8 points, 4 steals, 4 assists) and Hunter Wetherbee (9 points). "(Knoke) was great — they run him off a lot of screens, and we had to chase him everywhere — but 32 (Beatty) was kind of the difference. We had trouble guarding him," Humphreys said. Knoke tried to downplay the rivarly aspect of the matchup, saying "it was just like any other game," but he also noted that coming away with the win was "great — we can tell them we beat them twice." McNabb led the Indians with 15 points and four assists, and he was in Knoke's face most of the second half, holding the Lion to five points after the break. "When McNabb was out, it wasn't that hard (to get open). But when he was in, it was tough," Knoke said. A St. Helens freshman, 6-3 Neil Wolfe, chipped in, too, with some key second-half minutes, made necessary because starting center Parker Miller got into foul trouble and drew his fifth personal with 6:15 left. "That was wild and crazy," Wolfe said of his first experience in the basketball rivarly. "We needed to play really tough. Bodies were banging, everyone was really hyped. The way we kept our composure was amazing." The Lions credited their ability to pull through to more than X's and O's. "Our guys didn't back down," Waldher said. "We played like our community and our fans — they're hardworking people. "We want to come out and play hard and get after people. St. Helens basketball, everybody knows every time they play us, we play hard." 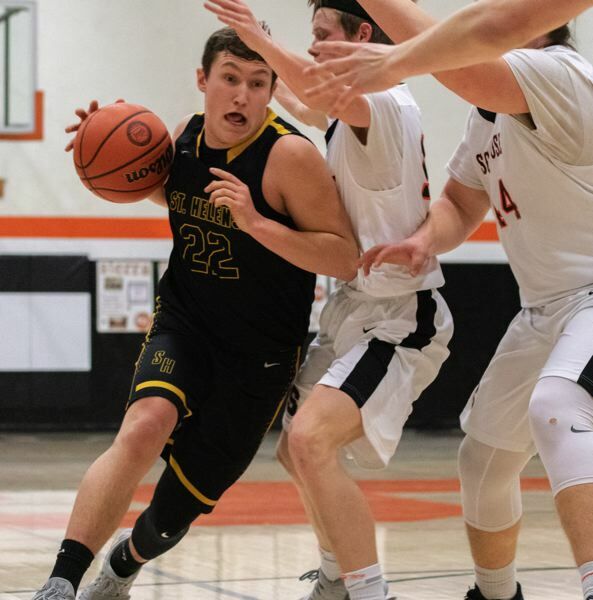 Scappoose, meanwhile, was able to generate enough offense to be highly competitive all night despite the absence of its best outside shooter, Kyle Negelspach, a junior who was home sick with the flu. He had scored 12 points in the Jan. 11 game. St. Helens wasn't able to take a minute, or even a play, off — the game was that tight, and always on the line. "We had to put everything into it, and we did," Beisley said. "But that's what we do. We don't stop. We keep going. We battle. "For the seniors, they'll remember it for the rest of their lives."